We’ve had a rough couple of days…. Sick kids are the worst. I mean seriously, runny noses, barking coughs & so much crying. I keep reminding myself, this too shall pass. But at 3am when your kid is so panicked about his lack of breathing and the amount of mucous in his head, that he makes himself throw up while you’re holding him and your mom instinct forces you to catch it all in your hand/shirt it’s hard to look past that moment to the morning even. We shall survive. That was Friday night, last night was better as we slept almost 7 hours rather than 4. This mornings doctors appointment gave mommy some piece of mind and an arsenal of drugs to kick it out of our house for now! Cash will grow out of this, apparently a reactive airway is so common. I’m thankful that each new incident brings me more knowledge and I am able to stay calm for him now. Lucas gets to try out the nebulizer breathing treatments so we can all be healthy & ready to fly on Wednesday. 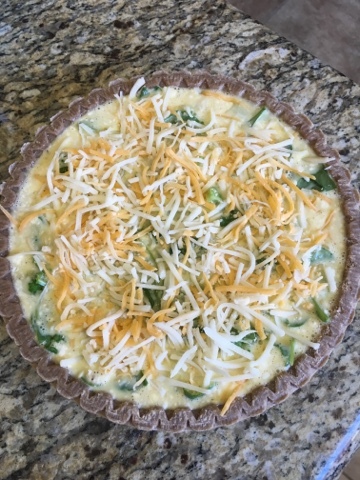 While Lucas naps & Cash watches Hocus Pocus (again) on the couch I finally got to try out a quiche recipe. I bought these awesome pre-made spelt shells at Whole Foods almost a month ago. They went right into the freezer until I could make the time to find the right recipe. 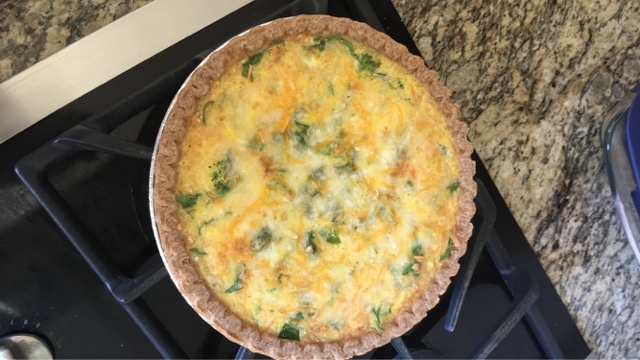 For a first time making quiche it’s easy as ‘pie’. Actually easier. I can already see so many options to change up the filling!! Even the boys were willing to eat it. The original recipe was for Broccoli only, but I have have a fridge full of veggies on the verge of going bad so I added spinach to it. 2. Press the pie crust into a pie dish, shape it how you like. Or make sure your pre-made crust is thawed & ready. 3. Put broccoli into microwave safe bowl and add 1/2 inch of water. Cover with plastic wrap and microwave 2-3 minutes, or until bright green and tender. 4. 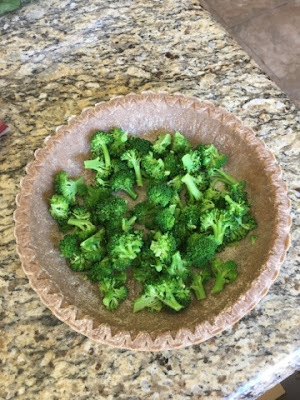 Drain broccoli and put it into the prepared pie crust. 6. Sprinkle half of the shredded cheese over the veggies. 7. In a medium bowl, whisk together eggs, half and half, flour, salt and pepper until well blended. 8. Pour the egg mixture over the veggies and cheese. 10. Bake 34-40 minutes, or until the top of the quiche is lightly golden and is firm with just a little jiggle. Like I said there are plenty of possible changes to this one. Adding in more spices. Bacon, ham, different veggies! Thank goodness my pie crust was a 2 pack. Next week we can try a different one.